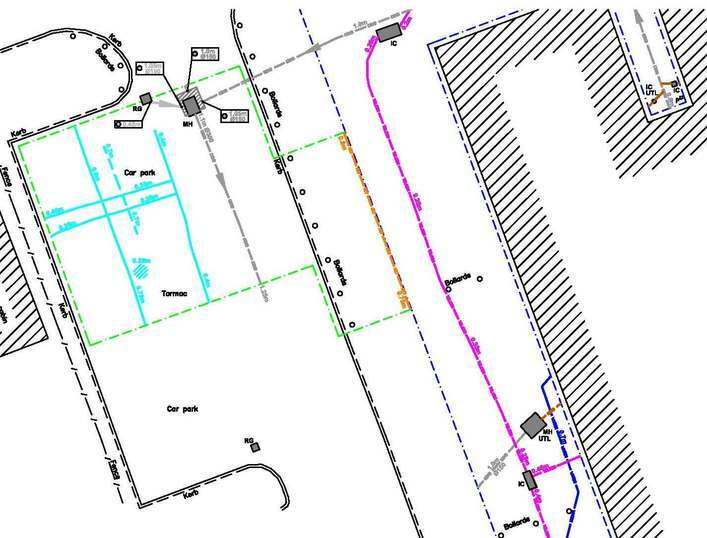 Utility Mapping Survey for buried services and utilities within the car park prior to the proposed installation of a modular boiler/ plant unit. Axis Europe were established in 1986 and strive to provide the highest service by offering ongoing facilities management as well as larger refurbishment and improvement project to their Local Authority housing clients. They are currently refurbishing the 1968, 20-storey tower block to provide new kitchens, bathrooms, a new heating system and improved lifts for the 130 households that live there. 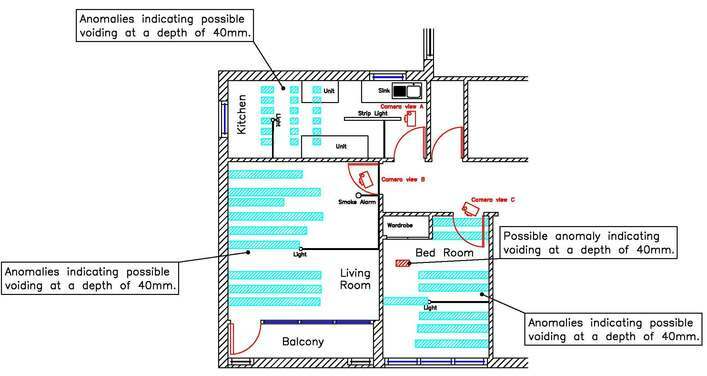 In order to provide information on the pattern of voiding within the ceiling of each unit, GEOTEC utilised a hand-held Ground Penetrating Radar System, designed to search for buried features to 0.4 metres from the surface of the ceiling to locate metallic and non-metallic targets as well as indicate anomalous areas such as voiding. The results were drawn onto the ceiling itself and then topographically recorded in order to produce the results, above. GEOTEC were also asked to carry out surveys prior to the installation of a plant room and the erection of scaffolding, to ensure that the scaffold did not fall into any unknown voids and that services and utilities beneath the scaffolding, or where excavation relating to the plant room installation was taking place, were not damaged. The depth of penetration of our survey was around 2 metres from ground surface and the aim was to locate the position, depth and utility type, regardless of the material of construction, to include, plastic pipes, fibre optic cables and ducts, communications and conductive services, as well as any sub-surface features such as obstructions or voiding. To achieve our objectives, we employed a range of techniques and technologies consisting ground penetrating radar (GPR), radio-frequency locators (EML) in active & passive modes, cover lifting, threading, signal induction and use of sondes. Our time on site also included for the collecting of suitable amounts of topographical reference data in order to accurately display our results in AutoCAD 2D plan view format, in DWG and PDF, as below. As part of this project, GEOTEC’s surveys ensured that Axis had as much information as possible in order to deliver this suite of works with as little disruption to the existing tenants as possible. This allowed them to make design decisions and limit the amount of excavation undertaken. Axis have always been very complimentary when completing our Post Project Completion Questionnaires displaying our level of customer service and professionalism, both onsite and offsite.